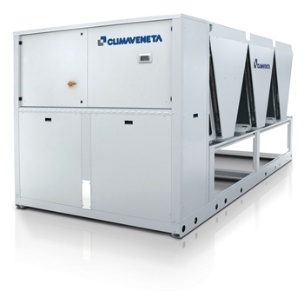 Air Cooled chillers, from 4.7 kW to 1710 kW, Water Cooled chillers up to 4191 kW as well as condenserless chillers up to 2240 kW. Most chillers are available with heat recovery. 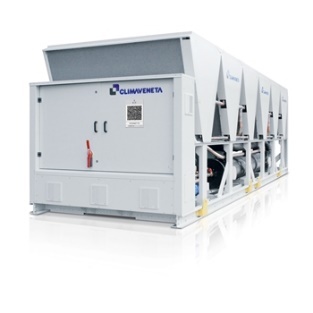 Climaveneta chillers can be configured in 4 noise levels (Standard, LN, SL and XL), each about 5dB(A) lower than the previous version. This can be combined with efficiencies from K (Key Efficiency) to CA-E (Class A Enhanced). 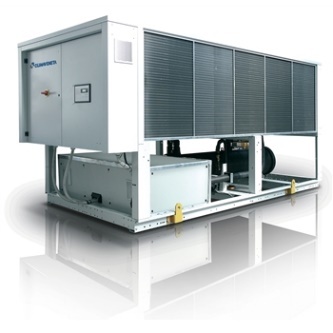 Outdoor unit for the production of chilled/hot water with variable speed (Inverter Driven) Scroll compressors, optimized for R410A in a single-circuit configuration, axial-flow fans, condensing coil with copper tubes and aluminum fins, plate heat exchanger on water side and electronic expansion valve as standard equipment. Flexible and reliable unit; it easily adapts itself to different thermal load conditions thanks to the precise temperature control together with the use of inverter technology. The high performance’s level, both full and partial load, is achieved thanks to the accurate unit’s design and to the use of variable speed (inverter) motor. 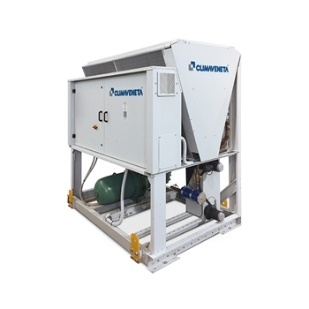 The chillers i-BX are used in many applications, even completely different from each other, suitable for comfort and industrial processes, without making any compromises. 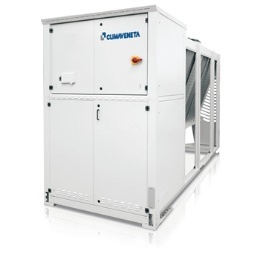 Outdoor unit for the production of chilled water with fixed speed and variable speed (Inverter Driven) Scroll compressors, optimized for R410A in a single-circuit configuration, axial-flow fans, micro-channel full-aluminum air coils and electronic expansion valve as standard equipment. 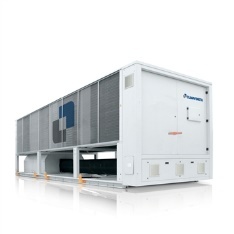 Flexible and reliable unit; it easily adapts itself to different thermal load conditions thanks to the precise temperature control together with the use of inverter technology. The high performance’s level, both full and partial load, is achieved thanks to the accurate unit’s design and to the use of fixed speed motor together with variable speed (inverter) motor. Outdoor unit for the production of chilled water with hermetic rotary Scroll compressors, ozone-friendly refrigerant R410A, axial-flow fans, plate heat exchanger, micro-channel full-aluminum air coils and thermostatic or electronic expansion valve, according to the model. The range is composed by units equipped with two compressors in a single-circuit configuration. Outdoor unit for the production of chilled water with hermetic rotary Scroll compressors, ozone-friendly refrigerant R410A, axial-flow fans, braze-welded plate-type heat exchanger, micro-channel full-aluminum air coils and thermostatic expansion valve. The range is composed by units equipped with four compressors in tandem configuration on two independent refrigeration circuits. Outdoor unit for the production of chilled water with hermetic rotary Scroll compressors, ozone-friendly refrigerant R410A, axial-flow fans, shell and tubes heat exchanger, micro-channel full-aluminum air coils and thermostatic or electronic expansion valve, according to the model. The range is composed by units equipped with four compressors in tandem configuration on two independent refrigeration circuits. Outdoor unit for the production of chilled water with semi-hermetic screw compressor optimized for R134a, axial-flow fans, micro-channel full-aluminum condensing coils, single-pass shell and tubes evaporator designed by Mitsubishi Electric Hydronics & IT Cooling Systems S.p.A. (brazed plate evaporator for sizes 0751 and 0851) and electronic expansion valve. Base and supporting structure and panels are of galvanized epoxy powder coated steel with increased thickness. Eurovent certification. Outdoor unit for the production of chilled water with hermetic rotary Scroll compressors, ozone-friendly refrigerant R410A, axial-flow fans, shell and tubes exchanger and electronic expansion valve. The range is composed by units equipped with four, six and eight compressors in multi-circuit configuration. Outdoor unit for the production of chilled water featuring oil-free centrifugal compressor, with R134a, axial-flow fans, condensing coil with copper tubes and aluminium fins, shell and tube flooded evaporator and electronic regulation valve. Base and supporting structure and panels are of galvanized epoxy powder coated steel with increased thickness. 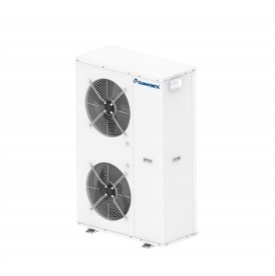 Flexible and reliable unit; it easily adapts itself to different thermal load conditions thanks to the precise thermoregulation together with the use of inverter technology. The compressor is radically innovative: magnetic bearings and digital rotor speed control allow partial load efficiency levels to be reached that were hither to impossible.. Outdoor unit for the production of chilled water featuring oil-free centrifugal compressor, with refrigerant HFO (1234-ze), axial-flow fans, condensing coil with copper tubes and aluminium fins, shell and tube flooded evaporator and electronic regulation valve. Base and supporting structure and panels are of galvanized epoxy powder coated steel with increased thickness. 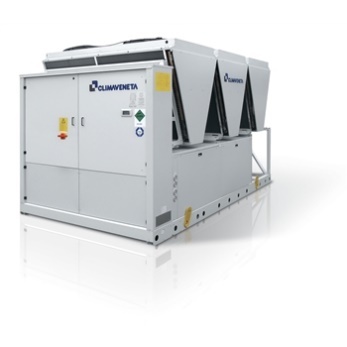 Flexible and reliable unit; it easily adapts itself to different thermal load conditions thanks to the precise thermoregulation together with the use of inverter technology. The compressor is radically innovative: magnetic bearings and digital rotor speed control allow partial load efficiency levels to be reached that were hither to impossible. 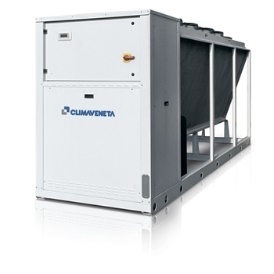 Outdoor unit for the production of chilled water with fixed speed and variable speed (Inverter Driven) screw compressors optimized for R134a, axial-flow fans, condensing coil with copper tubes and aluminium fins, shell and tube single pass evaporator designed by Climaveneta and electronic expansion valve. Eurovent certification for all the sizes. Base and supporting structure and panels are of galvanized epoxy powder coated steel. Flexible and reliable unit; it easily adapts itself to different thermal load conditions thanks to the precise temperature control together with the use of inverter technology. The high performance’s level, both full and partial load, is achieved thanks to the accurate unit’s design and to the use of fixed speed motor together with variable speed (inverter) motor. Outdoor unit for the production of chilled water with semi-hermetic screw compressors optimized for HFO refrigerant R1234ze, axial-flow fans, micro-channel full-aluminum condensing coils, single-pass shell and tubes evaporator designed by Mitsubishi Electric Hydronics & IT Cooling Systems S.p.A. and electronic expansion valve. Base and supporting structure and panels are of galvanized epoxy powder coated steel with increased thickness. Eurovent certification. Flexible and reliable unit; it easily adapts itself to different thermal load conditions thanks to the precise thermoregulation and the accurate sizing of all internal components. The compressors feature an enhanced lubrication system, an innovative internal geometry and a different control of capacity steps. Innovations that grant a remarkable performance improvement especially at partial loads. Outdoor unit for the production of chilled water with semi-hermetic screw compressors optimized for R134a, axial-flow fans, micro-channel full-aluminum condensing coils, single-pass shell and tubes evaporator designed by Mitsubishi Electric Hydronics & IT Cooling Systems S.p.A. and electronic expansion valve. Base and supporting structure and panels are of galvanized epoxy powder coated steel with increased thickness. Eurovent certification. Flexible and reliable unit; it easily adapts itself to different thermal load conditions thanks to the precise thermoregulation and the accurate sizing of all internal components. The compressors feature an enhanced lubrication system, an innovative internal geometry and a different control of capacity steps. Innovations that grant a remarkable performance improvement especially at partial loads.